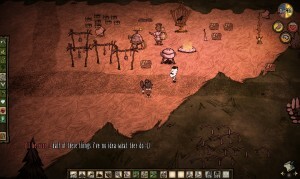 Don’t Starve was released last year and every day since, developers Klei Entertainment have been fielding requests for a multiplayer version of their survival sandbox. 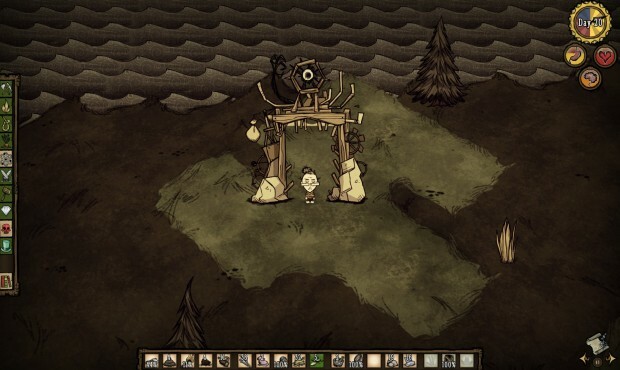 They finally acquiesced in May 2014 and the result is Don’t Starve Together, which launched on Steam in Early Access Beta this week. Superficially, it’s exactly the same game. Emotionally, it feels very different. 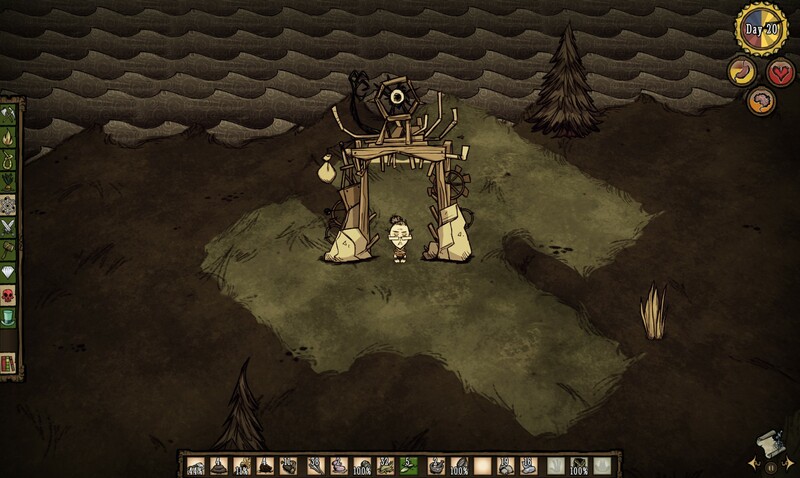 The original Don’t Starve is a constant struggle against the hostile world around you. It throws you in with a single, slightly misleading instruction: “You’d better find something to eat before night comes”. Most players die on their first night in the game, killed by a grue in the darkness who is affectionately known as Charlie. When you do eventually survive your first night, the game excels at giving you just enough time to get back on your feet before throwing a new obstacle in your face. Hounds attack during your second week. Winter starts at your fourth and the frozen climate totally screws with the food supply that you spent the last few hours building. 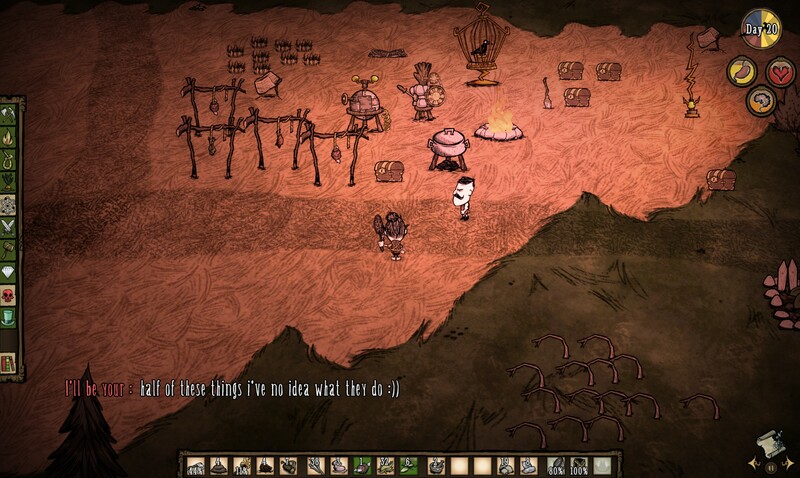 When starting a world in Don’t Starve Together, you have to deal with all that and a bunch of newbies blundering about, punching the beefalo and begging to be saved from a rampaging herd. It’s an… interesting experience. Community Minecraft servers are brilliant because you can travel vast distances and pool those resources together to build amazing things. All you need to do at the start is herd a few cows and remind everyone to feed them. In Don’t Starve Together, critical resources are still balanced on that knife edge. You have more rabbit holes, but also more mouths to feed. An experienced group of players can parcel out jobs and probably work quite efficiently to build a thriving, self-sustaining hub. An inexperienced player can eat their way through the entire winter’s food stocks in two minutes and still be hungry. As someone who can regularly make it past 50 days before dying of some foolish recklessness, it feels very much like The Ant and The Grasshopper. I spend hours farming rabbits, collecting manure and gathering berry bushes from all over the map to build a farm near my campfire. A friend pops in, sees a bunch of conveniently-placed berry bushes and harvests the lot without realising that they’ll rot before we can eat them. I can’t be angry. He was only trying to help. But we’re still both going to die come winter and then this world will be gone forever. It makes for a strange balance of behaviour from my perspective. On the one hand, I have to teach them how to play. Not just because it’ll be more fun. If I don’t, they’ll die and my sanity will slowly tick away as their spirit haunts me. That means I have to stop what I’m doing and go harvest some spider glands to resurrect them. On the other hand, I can’t just leave spider glands lying around in a chest because some fool will probably rub them on his face for minimal healing. So until I can sufficiently educate my friends, I’m like a mistrusting parent. I bring back plenty of resources for the good of the tribe, but I also secretly stockpile goodies in my inventory. It’s for their own good. I need to make sure my visitors don’t kill us all. You can buy access to the Don’t Starve Together beta and an extra code on Steam right now. Current owners of Don’t Starve will get Don’t Starve Together for free when it launches in the future. Also, there is an Endless mode where the world doesn’t vanish when we all die. I probably should have chosen that option instead.